It’s no secret that I love making cute food for my kids. In fact, sometimes I think I have more fun coming up with ideas and making them, then my kids do actually eating them! It’s become my creative outlet and I absolutely love it. Making your kids food cute doesn’t have to be hard, and is guaranteed to put a smile on their faces. I didn’t use any fancy tools to make this snack—just a regular old kitchen knife. This snack is definitely heavy on the fruit, so it’s a perfect snack for sharing. Both of my kids enjoyed sharing this snack together, or you could even share it with them too! 1. Wash and slice your pear in half lengthwise and scoop any core out from the inside. (You can eat the other pear half yourself!) Lie your pear down on the plate. 2. Wash your green grapes and then slice them in half lengthwise. 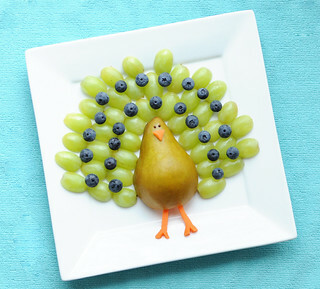 Place the green grapes around the pear to make the peacock’s feathers. 3. Wash your blueberries and place them neatly in between your grapes to add some detail to the feathers. 4. Wash your baby carrot and use your knife to cut out 2 legs and a triangle nose. Place the legs on the peacock and the carrot nose on the face. 5. Stick 2 sprinkles in the pear for eyes. 6. Give the snack to your kiddos and enjoy their giggles and smiles! What a fantastic snack for kids and a clever use of fruit. The peacock is perfect. It’s really great idea. Thank you. I came across your work on a friends Facebook and have enjoyed looking at ur work. Just wondering if you have a book out as I would like to get creative for my grandson.